With many new companies being created in the cloud era, and nearly all of the old ones moving to the cloud, the number of cloud based identities has skyrocketed. One of the key factors of this movement was the introduction of Google Apps for Work, which is now known as G Suite. Google’s online productivity suite drew millions of users away from the traditional on-prem Microsoft Office, and kickstarted the war between O365 and G Suite. Still though, the number of G Suite users has continued to climb, with over 70 million users on their education platform alone. Add in the personal and enterprise accounts and that number is even higher. The problem with these G Suite identities is that they can’t be managed as they had been previously when IT infrastructure was on-prem. Traditionally, IT organizations leveraged Microsoft’s directory solution Active Directory®, but that forces IT organizations to have one foot on–prem and one in the cloud. Furthermore, Google cloud identities can’t be leveraged for a number of other IT resources such as systems, cloud servers, legacy applications. WiFi authentication and more. This forces end users to have multiple identities and passwords to remember, creating more potential identity security risks. IT admins want to have one, central identity for a user that can grant access to all of their systems, applications, data, and networks. 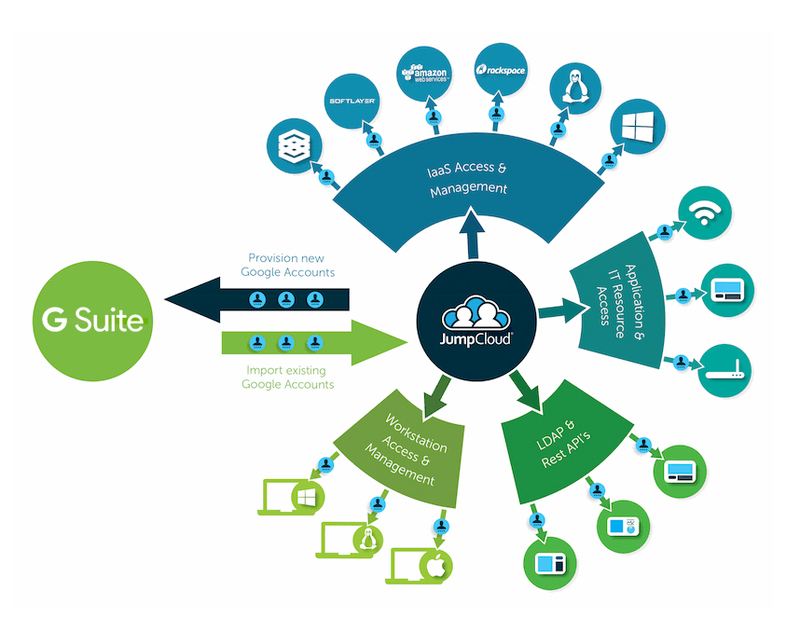 Fortunately, having that one identity for each user to access all IT resources is now possible through JumpCloud’s Directory-as-a-Service®. Our cloud-based directory can seamlessly integrate with G Suite, allowing the Google cloud identity to be imported into the cloud user store. This pre-populates the virtual identity provider, making the integration easier. In addition, once the G Suite identities are imported into the cloud directory, they can be federated out to all of your IT resources. This applies to when employees are terminated as well. Simply delete the user from the IDaaS platform’s web console, and that change is reflected in G Suite and all of the other associated resources. Check out the video below, which goes into more depth on the functionality of Directory-as-a-Service and provides a demonstration of how it works. 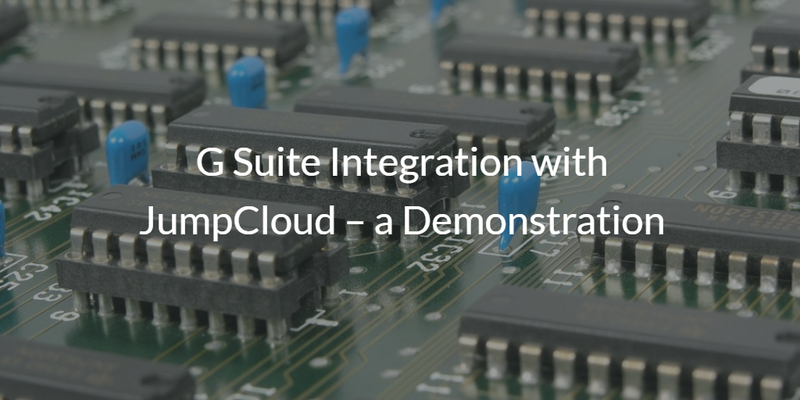 Combining G Suite with JumpCloud essentially creates a complete Active Directory replacement, with G Suite acting as the alternative to Microsoft Exchange and Office. If you have Google cloud identities that you want to federate out to your entire IT infrastructure, check out Directory-as-a-Service. You can sign up for a free account, and see how it works for yourself. Your first 10 users are free forever, so there’s no reason not to give it a shot. Alternatively, if you have any questions about how the cloud-based directory integrates with G Suite, feel free to drop us a note. We would be happy to answer any questions that you may have.